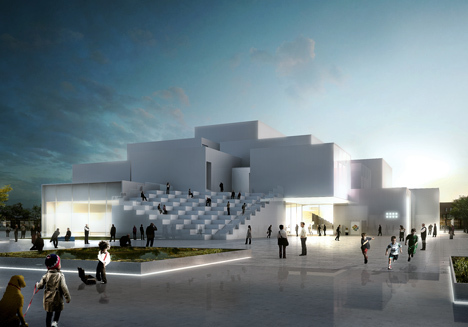 Today BIG unveiled their design for “The LEGO House”, the experience and education centre that illustrates the systematic creativity of LEGO bricks and is expected to attract 250,000 visitors annually. 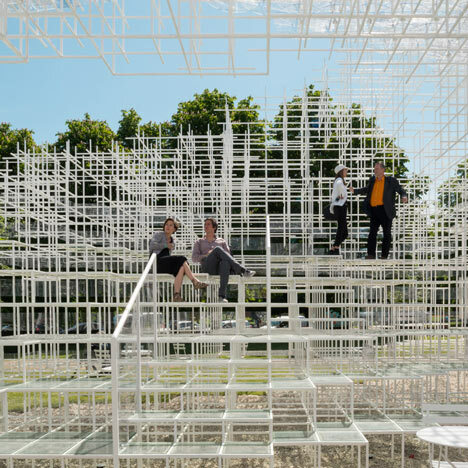 Sou Fujimoto: "I tried to create something between nature and architecture"
In this movie filmed at the unveiling of this year's Serpentine Gallery Pavilion in London today, Japanese architect Sou Fujimoto explains the effect he wanted to achieve with the design of his pavilion. "The inspiration started from the beautiful surroundings [of the Serpentine Gallery]," Fujimoto says. "I was so impressed by the beautiful green surroundings. So I tried to create in this green environment something between nature and architecture, tried to create a transparent sturcture that melts into the background." Chicago has many truly great buildings. It sits firmly on the map of global architecture and is the birthplace of the skyscraper. Creating a short video about just five great buildings is doing this city a massive disservice, as there are many and this is simply my thoughts. I hope you enjoy it. I loved creating it. Sound design: Noted in its absence! Connecting Hall, Main Entrance of the National Gallery and access between the palaces Salm and Schwarzenberg. There may be many interior designers, but only few design spaces that are optimized for user convenience. One of them is Choi Si-young, a leading interior designer in Korea, who has worked on numerous projects for the past 30 years. As a graduate of Hongik University Department of Architecture and Graduate School of Architecture & Urban Design, the current President of Korean Society of Interior Architects/Designers has previously served as the Art Director of Pyeongtaek Book City and Incheon International Airport, the Chairman of the Steering Committee of the International Federation of Interiors (IFI), and an advisor for LG Houses and the Korea Land & Housing Corporation. "The Community" might be the most frequently used term over the last 50 years of Architectural and Urban discourse. For decades, "the community" has served as a legitimization for anything from Team X to New Urbanism, from Celebration to "vancouverism". But what is "the community"? Where should we look for the proper definition? How did communities appear in the past and how do they form today? Can 'the community" influence the design of its own space, territoiry or context? 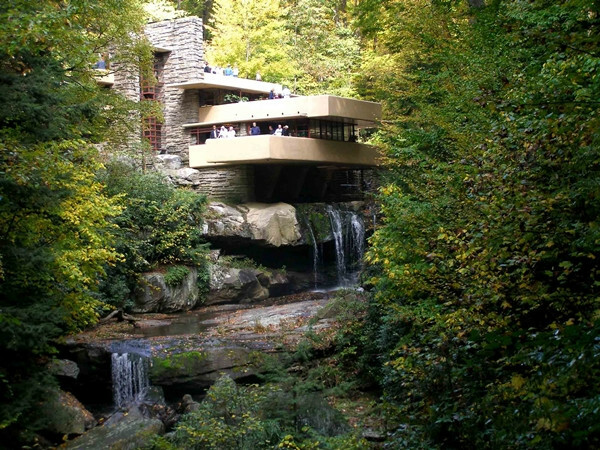 If yes, what could be the relationship between the community and architecture in the future? In his Strelka talk Reinier de Graaf is trying to answer these and other, even more complex questions. These clips are excerpts from the documentary "Mies in Krefeld" produced by qatsi.tv. a photorealistic manner and integrated in photographys or videos of the original location. The lecture will introduce Achim Menges' work on computational design approaches that unfold morphological complexity and performative capacity without differentiating between form generation and materialisation processes. His design research, conducted at the Architectural Association, at Harvard University and at his new institute at Stuttgart University over the last ten years, will be presented along a series of constructed prototype buildings. Achim Menges, born 1975, is an architect and professor at Stuttgart University where he is the founding director of the Institute for Computational Design. In addition he has been Visiting Professor in Architecture at Harvard University's Graduate School of Design. In May 2013, The Confederation of Danish Industry (DI) moved back into their rebuilt headquarters at Raadhuspladsen right next to Tivoli and City Hall in the heart of Copenhagen. The extensive architectural task has been carried out by Transform who has redesigned the physical manifestation of the DI. The new exterior part of the building consists of a great media façade, as a beacon of aesthetics in a sea of visual noise flowing in and around one of the most heavily trafficked intersections in Copenhagen. OMA partner Shohei Shigematsu presents 'Making Milstein Hall' at the opening of Milstein Hall at Cornell Unversity in Ithaca, New York. On the occasion of the second opening of Public Works, Reinier de Graaf lectures on the phenomenon of Civil Servant Architects in the 1960s and 1970s in Western Europe. The Exhibition first appeared in Venice at the 13th Architecture Biennale, and in Spring of 2013 was re-sited to ST AGNES in Berlin, a former Church which features as one of the buildings in the exhibition itself. Kai-Uwe Bergmann, Partner, Business Development of BIG, Bjarke Ingels Group, presented the lecture "Hedonistic Sustainability" on November 7, 2012 as part of Perspectives: the Fall 2012 Baumer Lecture Series at the Knowlton School of Architecture, The Ohio State University. The New York Public Library unveiled schematic designs, by Foster + Partners, of its Central Library Plan on December 19, 2012. In this short video, Lord Norman Foster and the Library's president, Tony Marx, describe the plan and its benefits for all New Yorkers and visitors to NYPL's main building on 42nd Street and Fifth Avenue. The Lewis Residence by Frank Gehry (1985-1995), Peter Eisenman's Frankfurt Biocentrum (1987), Chuck Hoberman's Expanding Sphere (1992) and Shoei Yoh's roof structures for Odawara (1991) and Galaxy Toyama (1992) Gymnasiums: four seminal projects that established bold new directions for architectural research by experimenting with novel digital tools. Curated by architect Greg Lynn, Archaeology of the Digital is conceived as an investigation into the foundations of digital architecture at the end of the 1980s and the beginning of the 1990s. A central feature of Princeton University's undergraduate education is the independent research requirement for juniors and seniors. In the School of Architecture, juniors take a design studio course each semester to meet the requirement.